Fighting the battle against breast cancer: Left to right: Donnalyn Robles (Breast Cancer Research Foundation (BCRF)), Randi Jorden (BCRF), Myra Biblowit, the president of the Breast Cancer Research Foundation; Loring Grove, Global Brand Manager at Streamlight, and Chanelle Goody (BCRF). 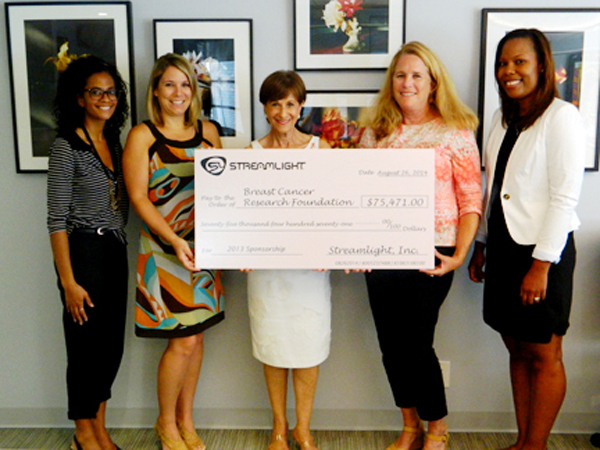 Streamlight, a leading manufacturer of high-performance lighting equipment and longtime American Police Beat partner, recently contributed more than $75,000 to the Breast Cancer Research Foundation (BCRF), a not-for-profit organization with a mission to achieve prevention of and a cure for breast cancer. Since 2010, Streamlight has donated $525,000 to the organization from sales proceeds of its “pink” flashlight products. Streamlight offers a series of pink lights imprinted with the BCRF logo, designed to raise awareness of the disease. For every pink Nano Light, pink ProTac HL, and pink Strion LED sold, $1, $3 and $5 respectively is donted to The Breast Cancer Research Foundation.